The actress is up against sitting MP Jayant Chaudhary, son of Rashtriya Lok Dal chief Ajit Singh. Yesteryear’s actress Hema Malini, who is contesting the Lok Sabha polls from here on a BJP ticket, has credited her long film career with helping her become a politician. “All my years in movies – all the hard work, tough outdoor schedules, long hours have all helped me in my new avatar as politician,” Malini posted on Twitter. 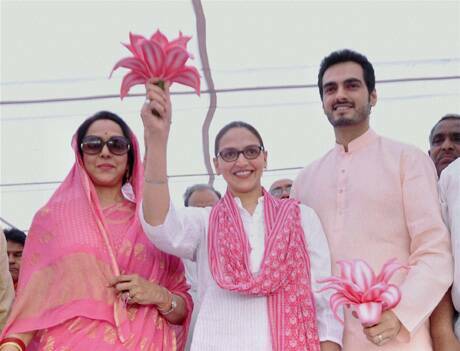 Mathura is going to polls on April 24 and Malini, who is known as Bollywood’s ‘Dream Girl’, says if she is elected by the people of Mathura, she will make sure that the position of women in the city improves by providing ample opportunities to them. “I want to do so much for Mathura – I want to set up self help groups for the women here so that they become independent. I want the women to spend their time wisely and earn money for themselves,” she tweeted. “I will be able to do all this only if I get elected! 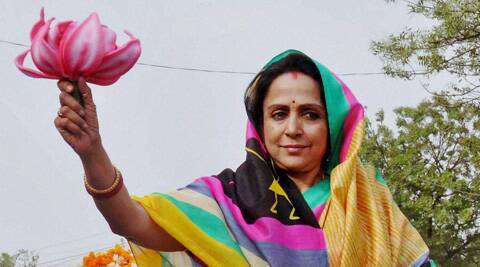 I plan to set up vocational training centres in the villages of Mathura where women can learn things,” Malini said.